The Group will draw from Ken’s work that shows the big picture/macrocosm, co-creating relationships in how to “accelerate the transition to a Circular Economy” through Systems Thinking – Nature as Model, Mentor and Measure. Ken Webster, author, will join us in our final session. We will connect the patterns already living in us in more depth to the Circular Economy and create our own unique relationship. Let’s form the language. Through a learning method that addresses the whole of us (imaginative thoughts; feelings/ existing patterns and relationships within each of us uniquely; and actions or intentions), not just a part – the intellect alone. We begin by stimulating our collective imaginations through peer to peer learning, creating pictures together of the text we read from ‘A Wealth of Flows’. This study group is for those of us who are part of this paradigm shift, or wish to be. 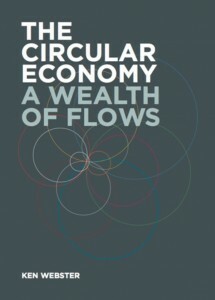 Taking as our starting point “Why a Circular Economy WILL work” – we will connect the big picture to our own already existing, individual and unique patterns and relationships. Welcome to all businesses; educators; inspired lay people and anyone who wishes to be part of the paradigm shift from a linear economy (take – use – waste), through sustainability (doing less harm), to a circular economy - decoupling of growth from finite resources. Where waste = food (cradle to cradle). Patrick Andrews, New Forest Advisory. Poet and founder of Human Organising Project. Restorative - by intention & design. Feedback rich - grounded in the study of non- linear, living systems; Built upon ‘cradle to cradle’ thinking - of biological and technical pathways – eliminating the concept of waste. Designed to overcome the current take-make-dispose model by transforming materials into useful goods and services - endlessly.